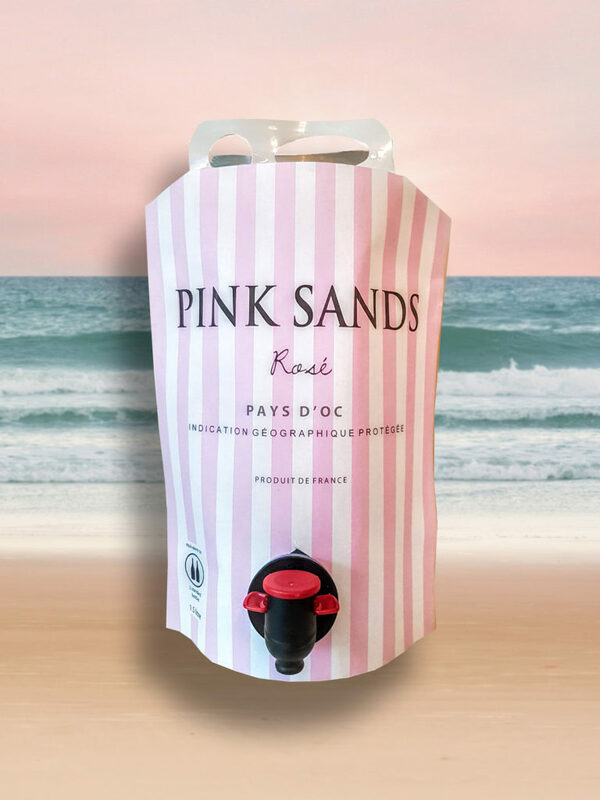 The inspiration for the Pink Sands Pouch came from drinking wine whilst sat on a beach in the Caribbean watching the sunset with friends. This 1.5L pouch is great for exactly those sorts of outdoor occasions, due to its lightweight and resistant packaging that makes it easy to transport. The perfect pink for al fresco dining and parties all year round. The grapes are sourced from vineyards in the foothills of the black mountains: Saint Chinian, Faugères, Cabrières, etc. Sourcing from these cooler regions means that we have a good fruit / acidity balance. The varieties are vinified separately and undergo temperature-controlled, cool fermentation to retain natural fruit flavours and characteristics. The wine is then blended, filtered and stabilized in stainless steel tanks before going into the pouches. The resulting wine is refreshing and full of ripe red fruit and wild flowers, with a fuller body than most Pays d’Oc rosés.